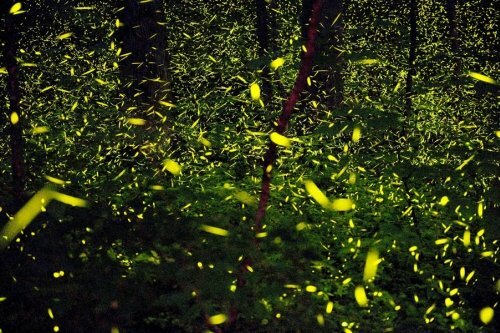 Fireflies or lightning bugs illuminate the sky in Tennessee's Great Smoky Mountains. A decade ago, entomologists and biologists warned the world’s firefly population was in decline. They chalked that up more recently to a lack of habitats and, among other things, light pollution, and the prevalence of mosquito-killing pesticides. These not-so-fun facts were largely anecdotal. Experts in the firefly field readily admit that getting an accurate count of the flickering critters – a family of insects in the beetle order Coleopetra and commonly called lightning bugs – is a relatively impossible task. With recent suburban skies resembling a disco-themed light show, though, tales of a decline felt a bit off. Those little greenish yellow flashes were visible as far as the eye could see, everywhere from hovering just above the grass to reaching the tree tops. That anecdotal observation prompted calls to experts, both local and national, for an update on the state of fireflies across the globe. Tackling the local perspective was Jon Gelhaus, the head of entomology at the Academy of Natural Sciences and a professor at Drexel University. From a national perspective, we spoke to Ben Pfeiffer, a firefly researcher from Texas and the driving force behind Firefly.org, a clearinghouse of information about the illuminated beetles. Gelhaus said tracking the some 20 to 30 different kinds of fireflies locally is “a little complicated” but noted that he, too, has seen more of them in early summer than in recent years. “Some literature has shown that light pollution is a big problem, mostly streetlights,” he said. “They are using the light that they generate themselves to signal, males to females, who respond with flashes of their own. They need to see this light to be effective. Gelhaus said development can also impact larva development as they live on the ground in leaf litter, marshes and similar areas. More housing means fewer such areas. This is problematic insofar as fireflies live longer in that larval stage (one or two years) than they do as flashing, flying critters (a few weeks). Pesticides are also having a negative effect. “When we talk about suburban and urban areas, we know about the agricultural uses of pesticides. Walk around a neighborhood and you’ll see those little flags about pesticides being applied to lawns,” he said. While spraying for mosquitos may have a societal benefit, it can also harm firefly populations. Still, Gelhaus has seen more of them this year. “It’s a wonderful sight. There’s a tiny little park where I was walking our dog the other night, and the whole treeline, it was twinkling with fireflies,” he said. “There aren’t a ton of habitats that aren’t using insecticides now. Pfeiffer's research work focuses primarily on his home state of Texas, but he said, internationally speaking, development is what leads many in the field to worry about firefly population loss. Still, some varieties are doing just fine, though. The “Photinus pyralis” – aka the Big Dipper firefly – is common in the Philadelphia region all the way down to Texas. “It’s pretty ubiquitous across the country, and it can adapt to a lot of environments,” he said. “That’s the type that most people are familiar with: it dips down and then flies back up, flashing, usually early in the evening since it’s the first to come out. “There’s more than one species, even though people tend to lump them altogether. These are doing OK, though, and they’ll continue to do fine. He said other populations – specifically, the species that adapt to a specific environment in unique habitats – can get entirely wiped out when that environment changes. Still, the Great Smoky Mountains are still a wonderful place to go see synchronous fireflies. “There’s not a lot of hard data on (overall populations) but if more people knew that some were disappearing, I think there’d be a lot more concern about it,” he said. “Once a (unique) population is wiped out, it’s gone forever. He cited a researcher in Lubbock, Texas, who told him about an area from which fireflies all but disappeared in the 1970s. His theory? When boll weevils wiped out cotton plants in the 1970s, along came “massive amounts of pesticides” which impacted the populations. If there is a resurgence, it can be tied to weather patterns. A wet winter followed by a good, wet spring will beget more fireflies. He said 2016 was a great year in that respect, with people reporting “swarms” of them in West Virginia. “Big swings in temperature aren’t beneficial. Consistent temperatures, good rainfall, sunny days that warm the ground up encourages things that (the larval fireflies eat),” he said, noting that modified corn-growing schedules that factor in the number of sunlight hours has been posited to predict firefly population growth. He did recommend getting out and looking at them soon, though. While his Texas has a longer season, he said the Philadelphia region is at its peak for just three or four weeks in late June into July. Pfeiffer suggested looking for different flash patterns to determine whether there are different species flying about, as well as comparing the hues of the flash ranging from amber to greenish-yellow to a bluer/darker-green shade. And yes, the ones flying near the treetops are different than those near the ground. “Looking for those differences can be really fun, even for people with an untrained eye in the field,” he said. I asked Gelhaus about the impact of children collecting them in jars to watch them inside the home. He said that would not have an impact on firefly populations (so don't feel bad, parents).